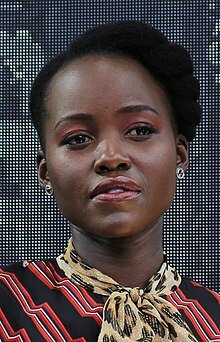 Lupita Amondi Nyong'o (Kenyan English: [luˈpiːtɑː ˈɲɔːŋɔ] ( listen); Spanish: [luˈpita ˈɲoŋ(ɡ)o]; born March 1, 1983) is a Kenyan-Mexican actress. The daughter of Kenyan politician Peter Anyang' Nyong'o, she was born in Mexico City, where her father was teaching, and was raised in Kenya from the age of one. She attended college in the United States, earning a bachelor's degree in film and theater studies from Hampshire College. Nyong'o began her career in Hollywood as a production assistant. In 2008, she made her acting debut with the short film East River and subsequently returned to Kenya to star in the television series Shuga (2009–2012). Also in 2009, she wrote, produced and directed the documentary In My Genes. She then pursued a master's degree in acting from the Yale School of Drama. Soon after her graduation, she had her first feature film role as Patsey in Steve McQueen's historical drama 12 Years a Slave (2013), for which she received critical acclaim and won several awards, including the Academy Award for Best Supporting Actress. She became the first Kenyan and Mexican actress to win an Academy Award. Nyong'o was born in Mexico City, Mexico, to Kenyan parents, Dorothy Ogada Buyu and Peter Anyang' Nyong'o, a college professor. The family had left Kenya in 1980 for a period because of political repression and unrest; Peter's brother, Charles Nyong'o, disappeared after he was thrown off a ferry in 1980. Nyong'o identifies as Kenyan-Mexican and has dual Kenyan and Mexican citizenship. She is of Luo descent on both sides of her family, and is the second of six children. It is a tradition of the Luo people to name a child after the events of the day, so her parents gave her a Spanish name, Lupita (a diminutive of Guadalupe). Her father is a former Minister for Medical Services in the Kenyan government. At the time of her birth, he was a visiting lecturer in political science at El Colegio de México in Mexico City. He later became a senior politician in Kenya. The family returned to their native Kenya when Nyong'o was less than one year old, as her father was appointed a professor at the University of Nairobi. She grew up primarily in Nairobi, and describes her upbringing as "middle class, suburban". When she was 16, her parents sent her to Mexico for seven months to learn Spanish. During those seven months, Nyong'o lived in Taxco, Guerrero, and took classes at the Universidad Nacional Autónoma de México's Learning Center for Foreigners. At the age of 14, Nyong'o made her professional acting debut as Juliet in Romeo and Juliet in a production by the Nairobi-based repertory company Phoenix Players. While a member of the Phoenix Players, Nyong'o also performed in the plays On The Razzle and There Goes The Bride. Nyong'o cites the performances of American actresses Whoopi Goldberg and Oprah Winfrey in The Color Purple with inspiring her to pursue a professional acting career. Nyong'o later attended St. Mary's School in Nairobi, where she received an IB Diploma in 2001. She went to the United States for college, graduating from Hampshire College with a degree in film and theatre studies. Nyong'o started her career working as part of the production crew for several films, including Fernando Meirelles's The Constant Gardener (2005), Mira Nair's The Namesake (2006), and Salvatore Stabile's Where God Left His Shoes (2007). She cites Ralph Fiennes, the British star of The Constant Gardener, as someone who inspired her to pursue a professional acting career. In 2008, Nyong'o starred in the short film East River, directed by Marc Grey and shot in Brooklyn. She returned to Kenya that same year and appeared in the Kenyan television series Shuga, an MTV Base Africa/UNICEF drama about HIV/AIDS prevention. In 2009, she wrote, directed, and produced the documentary In My Genes, about the discriminatory treatment of Kenya's albino population. It played at several film festivals and won first prize at the 2008 Five College Film Festival. Nyong'o also directed the music video "The Little Things You Do" by Wahu, featuring Bobi Wine, which was nominated for the Best Video Award at the MTV Africa Music Awards 2009. Nyong'o enrolled in a master's degree program in acting at the Yale School of Drama. At Yale, she appeared in many stage productions, including Gertrude Stein's Doctor Faustus Lights the Lights, Chekhov's Uncle Vanya, and William Shakespeare's The Taming of the Shrew and The Winter's Tale. While at Yale, she won the Herschel Williams Prize in the 2011–12 academic year for "acting students with outstanding ability" . Immediately after graduating from Yale, Nyong'o landed her breakthrough role when she was cast for Steve McQueen's historical drama 12 Years a Slave (2013). The film, which met with wide critical acclaim, is based on the life of Solomon Northup (played by Chiwetel Ejiofor), a free-born African-American man of upstate New York who is kidnapped and sold into slavery in Washington, DC, in 1841. Nyong'o played the role of Patsey, a slave who works alongside Northup at a Louisiana cotton plantation; her performance met with rave reviews. Ian Freer of Empire wrote that she "gives one of the most committed big-screen debuts imaginable," and critic Peter Travers added that she "is a spectacular young actress who imbues Patsey with grit and radiant grace". Nyong'o and co-star Michael Fassbender at an event for 12 Years a Slave (2013). Her performance in the film earned her the Academy Award for Best Supporting Actress. Nyong'o was nominated for several awards for 12 Years a Slave, including a Golden Globe Award for Best Supporting Actress, a BAFTA Award for Best Actress in a Supporting Role, and two Screen Actors Guild Awards, including Best Supporting Actress, which she won. She was also awarded the Academy Award for Best Supporting Actress, becoming the sixth black actress to win the award. She is the first African actress to win the award, the first Kenyan actress to win an Oscar, and the first Mexican to win the award. She was the 15th actress to win an Oscar for a debut performance in a feature film. Following a supporting role in the action-thriller Non-Stop (2014), Nyong'o co-starred in Star Wars: The Force Awakens (2015) as Force-sensitive space pirate Maz Kanata, a CGI character created using motion capture technology. Nyong'o said that she had wanted to play a role where her appearance was not relevant. The acting provided a different challenge from her role as Patsey. Scott Mendelson of Forbes, characterised Nyong'o's role as "the center of the film's best sequence," and Stephanie Zacharek of Time called her a "delightful minor character". Nyong'o was nominated for the Best Supporting Actress at the 42nd Saturn Awards and Best Virtual Performance at the 2016 MTV Movie Awards for her role. In 2015 Nyong'o returned to stage with a starring role as an unnamed girl in the play Eclipsed, written by Danai Gurira. The play takes place during the chaos of the Second Liberian Civil War, where the captive wives of a rebel officer band together to form a community, until the balance of their lives are upset by the arrival of a new girl (played by Nyong'o). Eclipsed became The Public Theater's fastest-selling new production in recent history and won Nyong'o an Obie Award for Outstanding Performance. The play premiered on Broadway at the John Golden Theatre the following year. It was the first play to premiere on Broadway with an all-black and female creative cast and crew. Nyong'o said that she understudied the play at Yale in 2009 and was terrified to play the character on stage. Her performance met with critical acclaim. The New York Times' critic Charles Isherwood called Nyong'o "one of the most radiant young actors to be seen on Broadway in recent seasons, shines with a compassion that makes us see beyond the suffering to the indomitable humanity of its characters." Nyong'o's performance in Eclipsed earned her a Theatre World Award for Outstanding Broadway or Off-Broadway Debut Performance, an Obie Award for a Distinguished Performance by an Ensemble, and a nomination for the Tony Award for Best Actress in a Play. In addition, she was nominated for Outstanding Actress in a Play at the Outer Critics Circle Award and a Distinguished Performance Award at the Drama League Award. Nyong'o said that she turned down Hollywood films for the part. Nyong'o co-starred in Jon Favreau's The Jungle Book (2016), a live-action/CGI adaptation of its 1967 animated original, voicing Raksha, a mother wolf who adopts Mowgli (played by Neel Sethi). Robbie Collin of The Daily Telegraph wrote in his review that Nyong'o brought a "gentle dignity" to her role. She later co-starred in Mira Nair's Queen of Katwe (2016), a biopic based on the true story about the rise of a young Ugandan chess prodigy, Phiona Mutesi (played by Madina Nalwanga), who becomes a Woman Candidate Master after her performances at World Chess Olympiads. Nyong'o played Phiona's protective mother, Nakku Harriet. Brian Tallerico of RogerEbert.com said, "Nyong'o is phenomenal. She has an incredible ability to convey backstory." Geoff Berkshire of Variety called Nyong'o's performance "Simply radiant in her first live action role since winning an Oscar for 12 Years a Slave [...] she imbues what could have been a stock mother figure with such inner fire that Harriet feels worthy of a movie all her own." Nyong'o reprised her role as Maz Kanata in Rian Johnson's Star Wars: The Last Jedi (2017), as well as in the animated series Star Wars Forces of Destiny. 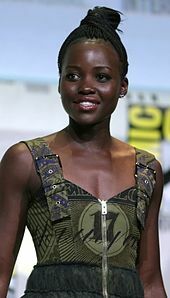 The following year, she starred as spy Nakia, a former member of Dora Milaje, a team of women who serve as special forces of Wakanda and personal bodyguards to T'Challa / Black Panther (Chadwick Boseman), in Ryan Coogler's superhero film Black Panther (2018), which marked the eighteenth film in the Marvel Cinematic Universe. In preparation for the role, Nyong'o learned to speak Xhosa and undertook judo, jujitsu, silat, and Filipino martial arts training. David Betancourt of The Washington Post wrote that the film "takes superhero cinema where it's never gone before by not being afraid to embrace its blackness"; he particularly praised Nyong'o's portrayal of her character for avoiding stereotypical depictions of a black leading lady, writing that she "throws punches, shoots guns and steals hearts in a role she seems born for." Black Panther earned over $1.34 billion to emerge as the ninth highest-grossing film of all time. Nyong'o received a Saturn Award for Best Actress nomination for the film. Following the success of Black Panther, Nyong'o starred as a kindergarten teacher dealing with a zombie apocalypse in the comedy horror film Little Monsters (2019). Amy Nicholson of Variety disliked the film but wrote that Nyong'o's "deadpan humor and grace ennoble the slapstick". The 2019 South by Southwest marked the premiere of her next release, Jordan Peele's psychological horror film Us. It tells the story of a family who are confronted by their doppelgängers. Emily Yoshida of New York magazine labeled her dual role "astounding" and found her portrayal of the doppelgänger to be "an achievement on another level; a physical, vocal, and emotional performance so surgical in its uncanniness that it almost feels like it could not be the work of a flesh-and-blood human." Us earned over $216 million against a budget of $20 million. Nyong'o will reprise her role as Maz Kanata for the third time in Star Wars: The Rise of Skywalker (2019), which will mark the final installment of the Star Wars sequel trilogy. She is developing a television series based on Chimamanda Ngozi Adichie's novel Americanah, which she will produce and star in. She will produce and star in Born a Crime, a film adaptation of Trevor Noah's memoir of the same name, in which she will play Noah's mother, Patricia; will star alongside Viola Davis in The Woman King, a drama based on the Dahomey Amazons; and will lend her voice to play the Giant in the live-animation film Jack. She has also committed to star in a remake of John Woo's 1989 action thriller The Killer and Simon Kinberg's ensemble spy-thriller 355. In addition, Nyong'o will narrate the Discovery Channel series Serengeti, about wildlife in the Serengeti ecosystem. Nyong'o will also make her writing debut with a book entitled Sulwe, which will be published by Simon & Schuster Books for Young Readers. Sulwe (Luo for "star") is the story of a five-year-old Kenyan girl, who has the darkest complexion in her family, for which Nyong'o drew upon her own childhood experiences. Nyong'o resides in Brooklyn, New York. She is a fluent speaker of Spanish, Luo, English, and Swahili. On February 27, 2014, at the Essence Black Women In Hollywood luncheon in Beverly Hills, she gave a speech on the beauty of black women and talked about the insecurities she had as a teenager. She said her views changed when she saw South Sudanese supermodel Alek Wek become successful. In 2013, her father was elected to represent Kisumu County in the Kenyan Senate and by 2017, he became Governor. Nyong'o's mother is the managing director of the Africa Cancer Foundation and her own communications company. Other family members include Tavia Nyong'o, a scholar and professor at New York University; Dr. Omondi Nyong'o, a pediatric ophthalmologist in Palo Alto, CA; Kwame Nyong'o, one of Kenya's leading animators and leading technology expert; and Isis Nyong'o, a media and technology leader who was named one of Africa's most powerful young women by Forbes magazine. In October 2017, Nyong'o wrote an op-ed for The New York Times, in which she revealed that Hollywood producer Harvey Weinstein sexually harassed her twice in 2011, while she was a student at Yale. She vowed that she would never work with Weinstein, hence her declining a role in Southpaw (2015). Nyong'o also wrote about her commitment to work with women directors or male feminist directors, who had not abused their power. This op-ed was part of a collection of stories done by The Times and The New Yorker which won the 2018 Pulitzer Prize for Public Service. Nyong'o was mentioned in Christian rapper Lecrae's song "Nuthin'" from his 2014 album Anomaly and was referenced by Jay Z in his verse from Jay Electronica's song "We Made It". She was also mentioned in the parody song "American Apparel Ad Girls" by the drag queens Willam Belli, Courtney Act and Alaska Thunderfuck. Nyong'o was mentioned in the 2015 African song "Nerea" by Kenyan afro-pop band Sauti Sol. Rapper Nicki Minaj mentioned Lupita in her verse on A$AP Ferg's remix of "Plain Jane" and was referenced by rapper Wale in his song "Black is Gold". Nyong'o was included in Derek Blasberg's 2013 best-dressed list in Harper's Bazaar. In 2014, she was chosen as one of the faces for Miu Miu's spring campaign, with Elizabeth Olsen, Elle Fanning and Bella Heathcote. She has also appeared on the covers of several magazines, including New York's spring fashion issue and the UK magazine Dazed & Confused. In April of that year, she was named "The Most Beautiful Woman" by People. and was named the new face of Lancôme, making her the first black woman to appear on the brand. Later that November, she was named "Woman of the Year" by Glamour. Nyong'o was included in Annie Leibovitz's 2016 Vanity Fair's Hollywood Issue. Nyong'o was honored with a caricature portrait in May 2016 at Sardi's restaurant in New York City for her debut on Broadway. That July, she was chosen as one of the first celebrities, alongside with Elle Fanning, Christy Turlington Burns, and Natalie Westling to star in Tiffany & Co.'s Fall 2016 campaign styled by Grace Coddington. Nyong'o appeared on Vogue′s October 2016 cover, making it her third issue. That month, she was an honoree at the 2016 Elle Women in Hollywood Awards. In January 2017, she appeared on the cover of Vanity Fair's Hollywood Issue. She later appeared on the cover of UK's The Sunday Times Magazine for their October '17 issue. On November 2017, she appeared on the cover of Grazia UK magazine. She later expressed her disappointment with the cover on social media for altering her hair to fit European standards of what hair should look like. Photographer An Le later apologized in a statement, saying it was "an incredibly monumental mistake". In December 2017, Nyong'o landed her fourth Vogue cover in a row for the January '18 issue, making her the first black actress to do so. She was also included in Tim Walker's 2018 Alice's Adventures in Wonderland - themed Pirelli Calendar as character The Dormouse. In June 2018, The Hollywood Chamber of Commerce announced Nyong'o will be among the honorees to receive a star on the Hollywood Walk of Fame in the film category. The following month, Nyong'o starred with fellow actress Saoirse Ronan for a Calvin Klein campaign for their new fragrance entitled "Calvin Klein Women". The campaign features both striking, minimalist portraits of the award-winning actresses alongside women they have personally been inspired by, where Nyong'o chosen Eartha Kitt and Katharine Hepburn as her inspirations. In October 2018, Nyong'o became a two-time honoree, alongside her Black Panther co-stars Danai Gurira and Angela Bassett for Elle magazine's "Women in Hollywood" issue. Nyong'o appeared on the cover of Vogue España's November '18 edition. Nyong'o is a 2019 Hollywood Walk of Fame honoree. 2016 Lip Sync Battle Herself Episode: "Lupita Nyong'o vs. Regina Hall"
^ "Lupita Nyong'o Biography: Theater Actress, Film Actress, Television Actress (1983–)". Biography.com (FYI / A&E Networks. Retrieved May 12, 2016. ^ "Actriz de '12 Years a Slave' presume orgullo mexicano" [Actress of '12 Years a Slave' shows Mexican pride]. Terra.com.mx (in Spanish). September 8, 2013. ^ Puente, Teresa (March 2, 2014). "Three Mexicans win Oscars". chicagonow.com. ^ "Oscar Winner Lupita Nyong'o Is 'the Pride of Africa'". ABC News. March 3, 2014. Retrieved November 30, 2014. ^ "Tony Award Nominations". Tony Award Productions. May 3, 2016. Archived from the original on May 6, 2016. Retrieved May 3, 2016. ^ The Late Late Show with Craig Ferguson. Season 10. Episode 1822. November 12, 2013. CBS. ^ a b c Walubengo, Laura (November 5, 2013). "A moment with Dorothy Nyong'o". africamagic.dstv.com. Archived from the original on May 12, 2014. Retrieved July 10, 2014. ^ "Lupita Nyong'o's Father, Peter Anyang' Nyong'o, Reveals Family Torture In Kenya". March 24, 2015. Retrieved October 6, 2016. I was born in Mexico because my father was teaching at a school in Mexico City. ^ Rivas, Jorge (May 14, 2014). "Lupita Nyong'o Teaches Mexican Kids How to Smile". Fusion. Archived from the original on May 27, 2016. Retrieved May 26, 2016. ^ Thatiana, Diaz (February 19, 2018). "Lupita Nyong'o on Living in Mexico: 'It Was Such a Bizarre, Dire Time for My Hair'". People. Retrieved October 28, 2018. ^ a b c d Williams, Sally (January 10, 2014). "Lupita Nyong'o: Interview with a rising star". The Guardian. London. Archived from the original on August 22, 2014. ^ a b c d "Matt LeBlanc, Lupita Nyong'o, The Fray". Jimmy Kimmel Live. January 14, 2014. ABC. ^ a b c d e Morris, Alex (February 9, 2014). "Lupita Nyong'o, From Unknown to 'It' Girl in Less Than a Year – The Cut". New York. Archived from the original on July 18, 2014. Retrieved March 2, 2014. ^ Stern, Marlow. "Lupita Nyong'o On Her Magical Journey from Kenya to '12 Years A Slave' and Possible Oscar Glory". The Daily Beast. Archived from the original on February 25, 2014. Retrieved July 10, 2014. ^ a b c Moreno, Carolina (February 4, 2014). "Lupita Nyong'o Talks Being Born In Mexico And Why She Misses It (VIDEO)". The Huffington Post. Archived from the original on March 14, 2014. Retrieved March 2, 2014. ^ a b c d e Gardner, Elysa (February 8, 2014). "For '12 Years a Slave' actress, Oscar nod is "ultimate bonus" of amazing journey". USA Today. Retrieved March 2, 2014. ^ a b Kimani, Ciku (January 31, 2014). "The rise and rise of Lupita Nyong'o – DN2". nation.co.ke. Archived from the original on March 4, 2014. Retrieved March 2, 2014. ^ Diaz, Evelyn (November 26, 2013). "Octavia Spencer, Oprah Winfrey and Lupita Nyong'o on Acting". BET. Archived from the original on February 22, 2014. Retrieved March 2, 2014. ^ Shapiro, Bee (February 10, 2014). "Actress Lupita Nyong'o Talks Hair and Makeup Tips and Working on 12 Years a Slave". Glamour. Archived from the original on February 23, 2014. Retrieved March 2, 2014. ^ Chege, Njoki (March 17, 2014). "Lupita was every bit the Cinderella in high school". Nairobi News. Nairobi. Archived from the original on April 21, 2014. Retrieved April 21, 2014. ^ "About the Director". InMyGenes.co.ke. Archived from the original on September 26, 2013. Retrieved August 31, 2013. ^ "Congratulations, Lupita Nyong'o 03F on your Academy Award for Best Supporting Actress". Hampshire College. March 3, 2014. Retrieved October 16, 2017. ^ a b c d e Samuels, Michael. "Hampshire College 2009–2010 News & Events, "Alumni Profile: International Filmmaker and Actress Lupita Nyong'o". Hampshire College. Archived from the original on February 22, 2014. Retrieved February 17, 2014. ^ Campbell, Christopher (November 3, 2013). "Watch '12 Years a Slave' Breakout Lupita Nyong'o In Her Film Debut 'East River'". Film School Rejects. ^ Herndon, Jessica (February 18, 2014). "Lupita Nyong'o is Hollywood's new fixation". AP.org. Associated Press. Archived from the original on February 25, 2014. Retrieved February 18, 2014. ^ Osenlund, R. Kurt (October 16, 2013). "On the Rise: Lupita Nyong'o, the Awards-Bound Breakout of 12 Years a Slave". Slant Magazine. Archived from the original on December 19, 2013. Retrieved March 2, 2014. ^ Freer, Ian (June 1, 2012). "12 Years a Slave". Empire. Archived from the original on March 7, 2014. Retrieved March 7, 2014. ^ Travers, Peter (October 17, 2013). "12 Years a Slave". Rolling Stone. Archived from the original on March 28, 2014. Retrieved March 7, 2014. ^ "Kenyan Actress Lupita Nyong'o Gets Rave Reviews At Hollywood Movie Premiere". Vibe Weekly. Archived from the original on December 14, 2013. Retrieved March 2, 2014. ^ Cieply, Michael; Barnesmarch, Brooks (March 2, 2014). "'12 Years a Slave' Claims Best Picture Oscar". The New York Times. Archived from the original on March 4, 2014. ^ "'Pride of Africa: Kenya celebrates Nyong'o's Oscar". Boston Herald. March 3, 2014. Archived from the original on March 9, 2014. Retrieved September 5, 2014. ^ "'12 Years a Slave' Actress Lupita Nyong'o Wins Oscar in Film Debut". Variety. March 2, 2014. Archived from the original on September 5, 2014. Retrieved March 6, 2014. ^ Obenson, Tambay A. (October 19, 2012). "Lupita Nyong'o Joins Nate Parker, Liam Neeson In Airplane Terrorist Thriller 'Non-Stop'". IndieWire. Retrieved February 22, 2019. ^ Breznican, Anthony (June 2, 2014). "'Star Wars: Episode VII' casts Lupita Nyong'o and Gwendoline Christie". Entertainment Weekly. Archived from the original on June 7, 2014. Retrieved June 2, 2014. ^ Robinson, Joanna (May 4, 2015). "Adam Driver's and Lupita Nyong'o's Characters Revealed in Exclusive Star Wars: The Force Awakens Photos—See all of Annie Leibovitz's photographs from the set of the year's most anticipated film". Vanity Fair. Retrieved May 9, 2015. ^ Carter, L. Kelley (December 13, 2015). "Why Lupita Nyong'o Didn't Want To Be Seen In "Star Wars"". Buzzfeed. Retrieved December 31, 2015. ^ Mendelson, Scott (December 16, 2015). "'Star Wars: The Force Awakens' Review: The Empire Strikes Out". Forbes. Retrieved February 29, 2016. ^ Zacharek, Stephanie (February 16, 2016). "Review: The Force Awakens Is Everything You Could Hope for in a Star Wars Movie—and Less". Time Magazine. Retrieved February 29, 2016. ^ Jacob, Bryant (February 24, 2016). "'Star Wars,' 'Mad Max,' 'Walking Dead' Lead Saturn Awards Nominations". Variety. Retrieved February 29, 2016. ^ Bell, Crystal (March 8, 2016). "Here Are Your 2016 MTV Movie Awards Nominees—Fan Voting Begins Right Now". MTV. Retrieved March 8, 2016. ^ Guglielmi, Jodi (February 3, 2016). "Lupita Nyong'o Urges for a 'Diversity of Stories to Be Told' as Ryan Murphy Launches Foundation to Support Minorities in Filmmaking". People. Retrieved February 4, 2016. ^ "TV Personality La La Anthony Boards Producing Team of ECLIPSED on Broadway". BroadwayWorld. January 20, 2016. Retrieved March 6, 2016. ^ Paulson, Michael. "Lupita Nyong'o Coming to Broadway in 'Eclipsed'". New York Times. Retrieved October 20, 2015. ^ Jordan, Kevin George (December 2, 2015). "Original Eclipsed Cast With Lupita Nyong'O Set For Broadway, Will Make History". Broadwayblack. Retrieved December 21, 2015. ^ Seymour, Lee (February 11, 2016). "Lupita Nyong'o And The All-Black, All-Female 'Eclipsed' Make Broadway History". Forbes. Retrieved February 11, 2016. ^ Cox, Gordon (March 4, 2016). "Lupita Nyong'o on Her 'Terrifying' Broadway Role in 'Eclipsed'". Variety. Retrieved March 6, 2016. ^ Isherwood, Charles (March 6, 2016). "Review: In 'Eclipsed,' a Captive Lupita Nyong'o Is Captivating". New York Times. Retrieved March 10, 2016. ^ "See Full List of 2016 Tony Award Nominations--". Playbill. Retrieved May 3, 2016. ^ Gans, Andrew (May 2, 2016). "Theatre World Awards Announce 2016 Winners". Playbill.com. Retrieved May 2, 2016. ^ "American Psycho and She Loves Me Lead 2016 Outer Critics Circle Award Nominations". Theater Mania. April 19, 2016. Retrieved April 19, 2016. ^ "The 82nd Annual Drama League Awards". DramaLeague.org. Retrieved April 20, 2016. ^ Gordon, David (May 23, 2016). "Ben Platt, Lupita Nyong'o, Georgia Engel, and More Win 2016 Obie Awards". Theatermania.com. Retrieved May 23, 2016. ^ Nyong'o, Lupita (May 3, 2016). "Lupita Nyong'o, Why I Chose a "Small Play" Over the Big Screen". LennyLetter. Archived from the original on June 9, 2016. Retrieved June 11, 2016. ^ Kit, Borys (April 23, 2014). "Scarlett Johansson, Lupita Nyong'o in Talks for Disney's 'Jungle Book' (Exclusive)--Jon Favreau is directing the live-action/CG hybrid adaptation of the Rudyard Kipling tale". THR. Retrieved September 12, 2015. ^ Collin, Robbie (April 15, 2016). "Forget about your worries, this new Jungle Book makes perfect sense – review". The Daily Telegraph. Retrieved May 8, 2016. ^ Fleming, Mike Jr. (January 9, 2015). "David Oyelowo & Lupita Nyong'o In Talks To Star In 'Queen Of Katwe' For Disney". Deadline. Retrieved January 9, 2015. ^ Sefa-Boakye, Jennifer (March 31, 2015). "Lupita Nyong'o Is Filming Disney's 'Queen Of Katwe' Chess Biopic In Uganda With David Oyelowo". OkAfrica. Archived from the original on September 24, 2015. Retrieved September 12, 2015. ^ Tallerico, Brian (September 23, 2016). "Queen of Katwe". Roger Ebert. Retrieved November 26, 2017. ^ Breznican, Anthony (April 13, 2017). "Star Wars highlights female heroes in Forces of Destiny — first look". Entertainment Weekly. Time, Inc. Retrieved April 19, 2017. ^ Eligon, John (February 16, 2018). "Wakanda Is a Fake Country, but the African Language in 'Black Panther' Is Real". The New York Times. ISSN 0362-4331. Retrieved February 17, 2018. ^ Trumbore, David (January 24, 2018). "'Black Panther': 90 Things to Know about the MCU's Game-Changing Movie". Collider. Archived from the original on January 24, 2018. Retrieved January 24, 2018. ^ Betancourt, David (February 12, 2018). "'Black Panther' fully embraces its blackness — and that's what makes it unforgettable". The Washington Post. Retrieved February 16, 2018. ^ "Black Panther (2018)". Box Office Mojo. Retrieved April 13, 2018. ^ Nicholson, Amy (January 28, 2019). "Sundance Film Review: 'Little Monsters'". Variety. Retrieved March 9, 2019. ^ Yoshida, Emily (March 9, 2019). "Jordan Peele's Us Is a Messy, Chilling Descent Into the American Nightmare". New York. Retrieved March 11, 2019. ^ "Us (2019)". Box Office Mojo. Retrieved April 8, 2019. ^ Galloway, Stephen (January 25, 2018). "Lupita Nyong'o: From Political Exile to Oscar to Marvel's 'Black Panther'". The Hollywood Reporter. Retrieved February 16, 2018. ^ N'Duka, Amanda (February 21, 2018). "Lupita Nyong'o to Star in 'Born A Crime' Based on Trevor Noah's Memoir". Deadline.com. Retrieved February 21, 2018. ^ Galuppo, Mia (March 1, 2018). "Viola Davis, Lupita Nyong'o to Play Mother and Daughter in 'The Woman King'". The Hollywood Reporter. Retrieved March 1, 2018. ^ Milligan, Mercedes (April 27, 2018). "Oscar Winner Lupita Nyong'o Voicing Live Animation 'Jack' for Baobab". Animation Magazine. Retrieved April 29, 2018. ^ Fleming Jr, Mike (April 30, 2018). "John Woo Taps Lupita Nyong'o For 'The Killer' Redo At Universal". Deadline. Retrieved April 30, 2018. ^ Fleming Jr., Mike (May 1, 2018). "Hot Cannes Package '355': Jessica Chastain, Marion Cotillard, Penelope Cruz, Fan Bingbing, Lupita Nyong'o Form Spy Sisterhood". Deadline. Retrieved May 1, 2018. ^ Nordyke, Kimberly (April 4, 2019). "Lupita Nyong'o to Narrate Discovery Channel Wildlife Series 'Serengeti' (Exclusive)". The Hollywood Reporter. Retrieved April 4, 2019. ^ Gyarkye, Lovia (January 17, 2018). "Lupita Nyong'o to Publish a Children's Book". New York Times. Retrieved January 17, 2018. ^ Miller, Gregory E. (October 12, 2013). "Brooklyn's Lupita Nyong'o fuels Oscar buzz". New York Post. Archived from the original on December 22, 2013. Retrieved August 19, 2014. ^ Rothman, Lily (February 28, 2014). "Oscar Nominee Lupita Nyong'o: Essence Speech on "Beauty of Black " |". Time. Archived from the original on March 1, 2014. Retrieved March 2, 2014. ^ Babatunde, Mark (August 11, 2017). "Lupita Nyong'o's Father Elected Governor in Kenya". Face2FaceAfrica. Retrieved December 22, 2017. ^ Lagat, Millicent. "African Women Who Inspire: Isis Nyong'o". AkiliDada. Archived from the original on September 26, 2013. Retrieved October 23, 2013. ^ Nseheis, Mfonobong (June 12, 2012). "Africa's Most Successful Women: Isis Nyong'o". Forbes.com. Archived from the original on October 21, 2013. Retrieved October 23, 2013. ^ "Lupita Nyong'o seeks Va. slave-trade preservation". Richmond Times-Dispatch. Associated Press. October 24, 2014. Archived from the original on October 24, 2014. Retrieved October 24, 2014. ^ "Lupita Nyong'o Pens #SaveShockoe Letter to Mayor Jones". wric.com. October 20, 2014. Retrieved November 30, 2014. ^ WildAid. "News—Lupita Nyong'o Joins WildAid as Global Elephant Ambassador". WildAid. Retrieved June 30, 2015. ^ Cox, Gordon (April 5, 2016). 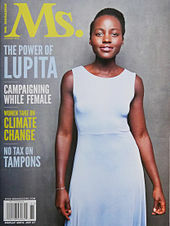 "Lupita Nyong'o Backs Mother Health Intl. for African Relief". Variety. Retrieved April 5, 2016. ^ Watt, Andrew. "Watch Lupita Nyong'o's ivory burn message". BritsInKenya. Retrieved May 11, 2016. ^ "Lupita Nyong'o Joins Kenyan Celebrities for New Wildlife Campaign". WildAid. April 27, 2016. Retrieved May 11, 2016. ^ Nyong'o, Lupita (October 20, 2017). "Lupita Nyong'o: Speaking Out About Harvey Weinstein". New York Times. Retrieved October 20, 2017. ^ "The New York Times, for reporting led by Jodi Kantor and Megan Twohey, and The New Yorker, for reporting by Ronan Farrow". Pulitzer Prize. Retrieved June 12, 2018. ^ "American Apparel Ad Girls with Courtney Act, Alaska 5000 and Willam #AAAgirls". youtube. Retrieved November 30, 2014. ^ Mugo, Kari (May 16, 2015). "Kenya's Sauti Sol to kickoff U.S tour in Minnesota". Mshale. Retrieved June 16, 2015. ^ Setaro, Shawn (December 15, 2017). "Nicki Minaj Shouts Out Biggie on ASAP Ferg's "Plain Jane" Remix". Complex. Retrieved December 15, 2017. ^ Schwadron, Eli (December 12, 2016). "Wale Raps Over a Classic D'angelo Song for "Black Is Gold" Video". XXL. Retrieved December 15, 2017. ^ Feldman, Jamie (February 10, 2014). "Lupita Nyong'o Covers New York Magazine's Spring Fashion Issue, Looks Stunning As Usual". The Huffington Post. Archived from the original on February 22, 2014. Retrieved March 2, 2014. ^ Wilson, Julee (January 14, 2014). "Lupita Nyong'o Covers Dazed & Confused, Proving Yet Again She Is Fashion's New 'It' Girl (PHOTOS)". The Huffington Post. Archived from the original on January 17, 2014. Retrieved March 2, 2014. ^ "Lupita Nyong'o Is PEOPLE's Most Beautiful". People. April 23, 2014. Archived from the original on August 15, 2014. Retrieved April 23, 2014. ^ Freydkin, Donna (April 4, 2014). "Lupita Nyong'o is new face of Lancôme". USA Today. Retrieved April 4, 2014. ^ Bennetts, Leslie (November 3, 2014). "The Breakthrough: Lupita Nyong'o". Glamour. Retrieved November 5, 2014. ^ "Lupita Nyong'o Makes Her US Vogue Debut & It's Seriously Beautiful". ^ Marshall, Lee (June 20, 2014). "Lupita Nyong'o is Vogue's newest cover girl". Archived from the original on June 21, 2014. Retrieved June 21, 2014. ^ Sykes, Plum (September 17, 2015). "Lupita Nyong'o's Second Vogue Cover! The Star Wars Actress On Hollywood and High Fashion". Vogue. Retrieved September 17, 2015. ^ Workneh, Lilly (October 21, 2015). "Harlem Dedicated A Whole Day To The Glorious Lupita Nyong'o – Way to go, Lupita!". Hufflington Post. Retrieved October 22, 2015. ^ Wolcott, James. "From Jennifer Lawrence to Lupita Nyong'o: Hollywood's Fiercest Women Photographed by Annie Leibovitz". Vanity Fair. Retrieved December 13, 2017. ^ Gordon, David (May 19, 2016). "Eclipsed Star Lupita Nyong'o Receives a Sardi's Caricature—Nyong'o is a 2016 Tony nominee for her performance in Danai Gurira's drama". Theatermania. Retrieved May 19, 2016. ^ McCall, Tyler (July 19, 2016). "TIFFANY & CO. TAPS CELEBRITY FACES FOR THE FIRST TIME—Lupita Nyong'o and Cool Teen™ Elle Fanning star in the brand's Fall campaign styled by Grace Coddington". Fashionista. Retrieved July 19, 2016. ^ Oliver, Ellen (October 26, 2016). "Amy Adams, Lupita Nyong'o, Kristen Stewart and other honorees shine at Elle Women in Hollywood Awards". LA Times. ^ "The 2017 Vanity Fair Hollywood Issue Cover Is Here—See Annie Leibovitz's portrait of Emma Stone, Natalie Portman, Ruth Negga, and more". Vanity Fair. January 26, 2017. ^ "Sunday Times Style Magazine". Models.com. October 1, 2017. Retrieved December 13, 2017. ^ Mezzofiore, Gianluca (November 14, 2017). "Photoshopped Lupita Nyong'o cover was a 'monumental mistake' says photographer". Mashable. Retrieved December 12, 2017. ^ Okeowo, Alexis (December 11, 2017). "How Lupita Nyong'o Transformed Herself Into Hollywood's Newest Superhero". Vogue. Retrieved December 12, 2017. ^ Chan, Stephanie (July 20, 2017). "Lupita Nyong'o, RuPaul Star Alongside All-Black Cast for Pirelli 2018 Calendar". HollywoodReporter. Retrieved December 13, 2017. ^ Bitran, Tara (June 25, 2018). "Robert De Niro, Lupita Nyong'o, Pink Among 2019 Walk of Fame Honorees". Variety. Retrieved June 25, 2018. ^ Kristina, Rodulfo (July 16, 2018). "Lupita Nyong'o and Saoirse Ronan Are the (Bare!) New Faces of Calvin Klein". Elle Magazine. Retrieved July 16, 2018. ^ Elle Magazine Staff (October 10, 2018). "These are Elle's 2018 Women in Hollywood". Elle Magazine. Retrieved October 15, 2018. ^ Vogue Staff (October 18, 2018). "El futuro es ahora: una visión de moda en Vogue noviembre". Vogue. Retrieved October 18, 2018. ^ McMillan, Graeme (May 4, 2016). "'Lego Star Wars: The Force Awakens' Writer Talks New Mythology and Celebrity Voices". The Hollywood Reporter. Retrieved December 9, 2016. ^ "Eclipsed". Playbill. Archived from the original on October 21, 2015. Retrieved October 5, 2015. 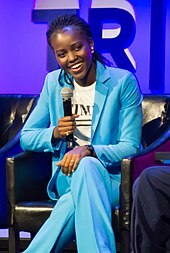 Wikimedia Commons has media related to Lupita Nyong'o.